Gardner is still the backup QB, but is he too good to keep on the sideline? We're two practices into spring football and position switches abound. Some are more obvious than others, some are a work-in-progress which may or may not really happen. But most, if not all, are worthwhile discussion. First, let's look at what fancy nuggets the spring roster has unveiled. And surprise surprise, all of them have to do with the DE spot. Jibreel Black has switched from DE to DT. Jordan Paskorz switched from DE to TE, Brenden Beyer went from LB to DE and Chris Eddins went from DE to TE. On offense, the WR spot is up in the air at the moment with the graduation of Junior Hemingway and the early departure of Darryl Stonum. So to fill the void at flanker, Roy Roundtree has been moved to that spot. I am curious who else will step up in that department. I would like to think that Jeremy Jackson and Jerald Robinson would be the likely candidates. I think either or both could be poised for breakout years. We're well covered in the slot with Drew Dileo and Jeremy Gallon still filling that role nicely. 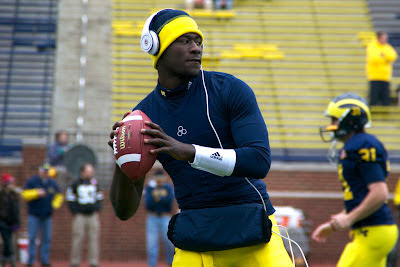 However, there's rumors of Devin Gardner getting some looks at WR this spring. I am completely fine with this for two reasons. 1) It means he's willing to do anything to get more playing time, and with his 6-4, 205-pound frame, I'm all for that, especially at WR where we need big athletic play makers. He's got great athletic ability and he deserves to get more playing time. And 2) It means Russell Bellomy is getting more comfortable and versed in the QB role. Two major holes need filling along the OL. Center, where David Molk earned the Rimington Award last year, which will be the hardest to fill. And the right tackle spot left open by the departing Mark Huyge. And, now that Rocko Khoury has left the team, I think the center spot – while up in the air at the moment, will likely go to Ricky Barnum when it's all said and done. Michael Schofield will slide from guard over to right tackle, leaving just one guard spot, likely the left guard spot open, where I think it's a battle between newcomer Kyle Kalis and senior Elliott Mealer. Jack Miller is the wild card in my opinion. If he can impress the coaches enough to make a splash at center, that would have a ripple effect where Barnum would then compete for the LG spot. I also think Patrick Omameh is solid at right guard and of course Lewan is only going to improve at left tackle. The only other area where we lose solid senior leadership from last year is the interior of the defensive line. Ryan Van Bergen and Mike Martin were asked to do way too much last year, mainly due to the fact that they were very good, and that we didn't really have anyone else who could contribute at the same level for any consistent period of time. As noted above, Jibreel Black switched from DE to DT, where he very well could flourish. But the real question everyone wants answered is how good can Will Campbell be? The 5-star recruit has never really stepped up at Michigan to the level many had expected. And the most frustrating part of it is you just know that he has the potential to be great, but just hasn't. 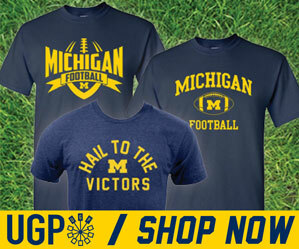 It would seem that the coaches are putting a lot of pressure on this spring. Not just because they want to see him take that next step, but because they need him to. If you look at who else we have at DT – Nathan Brink, Quinton Washington, Kenny Wilkins and Richard Ash – all names we've heard of, but no one who's a standout player. I think Brink has a ton of upside given that he's a walk-on and he was already pushing the seniors last year. But clearly, we need all of these guys to step up. The defensive end spot is seemingly well spoken for with Craig Roh, Frank Clark and Brenden Beyer. Roh will switch from weak side end to strong side end, which I am in total agreement with. And, let's not forget about the six incoming defensive lineman who will certainly push these guys, if not outright contend for their jobs when fall camp comes around. More on those incoming freshman on the way.